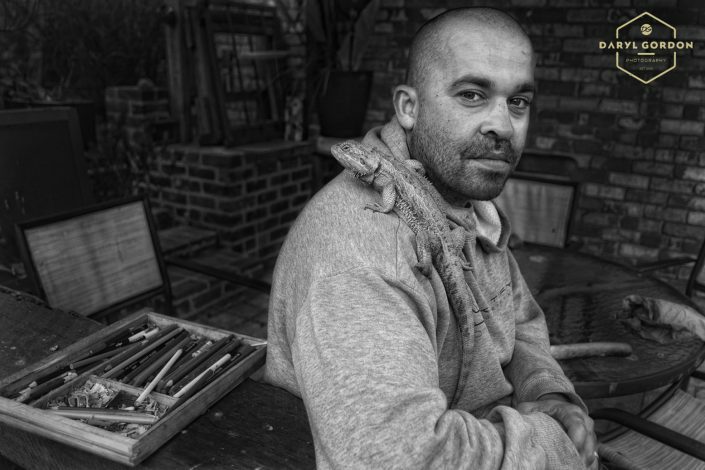 Daryl Gordon is a photographer from Balnarring who has been working on his Peninsula People project for over a decade. This is the first time this selection of portraits he photographed from 2003-2015 has been displayed on the Peninsula. The series began when he was meeting and photographing people for the local newspaper. He works in the documentary, editorial-style of photography, capturing a moment in time with a person in their own setting. Like a portrait painter, Gordon draws out the personality of his sitter, by photographing them in a familiar environment. The exhibition includes Gus and Lou, local music legends in Balnarring, musician James Reyne with his guitar, local kindergarten teacher Karen Anderson, Dame Elisabeth Murdoch, journalist Mike Morris and our very own MPRG Director Jane Alexander. These are the faces of the Mornington Peninsula.